The Blot didn’t get to post these last few movie posters for Marvel’s Guardians of the Galaxy Vol. 2 because I was out of town in Orlando at Disney World. So what better time to catch up than on July 4th! 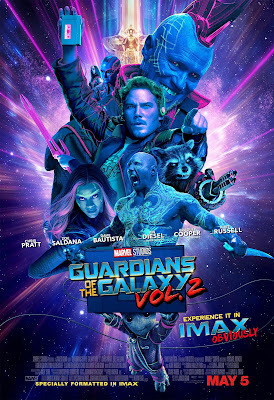 Here’s Marvel’s final theatrical one sheet IMAX movie poster for Guardians of the Galaxy Vol. 2. What do you think!?! It’s actually one of the better posters Marvel has released in a long, long time. I love how the poster’s design is able to capture both Gunn’s comedic take on super hero films, as well as the team’s epic space adventure to come.